Genealogist Amy Crow at No Story Too Small has challenged us to blog about one ancestor a week for 52 weeks. This is a great idea! I realized a few weeks ago that I tend to write about certain branches of my family more than others. I'd like to get to know more of my ancestors, even if it's just a brief write-up. I will also take a look at some of the challenges that I'm having in my research. By the 1840s, the Dashers were living in Lowndes County Georgia. Susan first married Richard Howell in 1853. They had one son, also named Richard. After her husband died, Susan married my 2nd great grandfather Noah Parramore in 1856. Their daughter Susan Parramore is my great grandmother and the wife of Alexander Shaw Pendleton. While researching Susan Dasher, I came across a Susan C. Dasher listed in the 1850 Lowndes County agricultural schedule. A portion of the 1850 Lowndes County Georgia agriculture schedule. Susan C. Dasher is highlighted in red. I wondered if this was "my" Susan. If so, I thought how great it was that she owned a farm at the age of 26 and before she was even married. Then I wondered how she came into possession of a farm in the first place. Did she inherit it from someone? 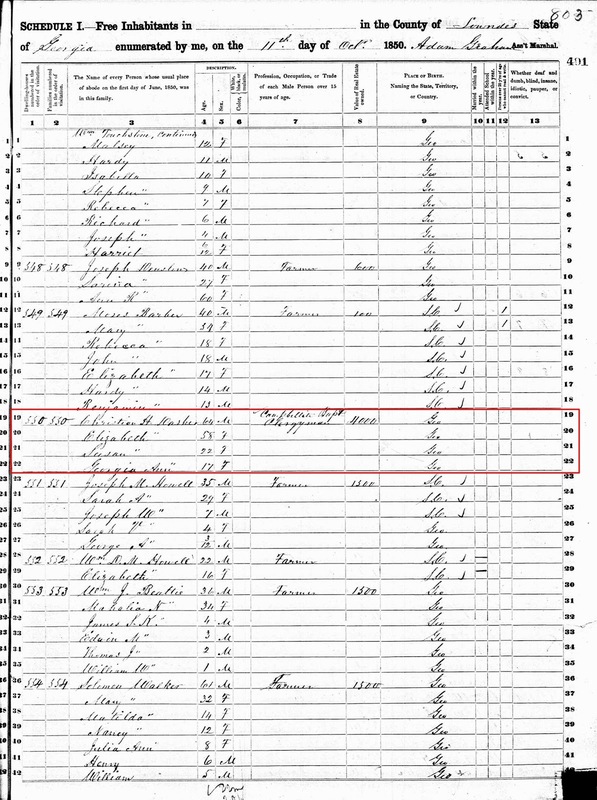 However, according to the 1850 Lowndes County Georgia census, she's living with her parents Christian and Elizabeth Dasher and sister Georgia Ann. I decided I'd better look into this. The 1850 U.S. census for Lowndes County Georgia. The Christian H. Dasher household is outlined in red. The Susan C. Dasher in the 1850 agriculture schedule could be Susan C. Wisenbaker, wife of Edwin A. Dasher. Susan and Edwin bought a farm when they moved to Lowndes County around 1841. After Edwin died in 1844, his brother James A. Dasher managed the estate for the next three years. Then Mrs. Dasher's brothers John and James A. Wisenbaker took over management. In both the 1850 agricultural schedule and the 1850 Lowndes County Georgia U.S. census, there is a James A. Dasher next door to Susan C. Dasher. This Susan was living on the farm. In the 1850 census, her age is given as 37. This leads me to believe that the Susan C. Dasher in the 1850 agricultural schedule is Susan C. Wisenbaker Dasher and not my Susan C. Dasher. I'm just a little disappointed that the farm didn't belong to "my" Susan, but I'm glad I looked into this a little further instead of just assuming. This is yet another example of thinking you have information about your ancestor only to find out that it's about someone else with the same name! History of Lowndes County Georgia 1825-1941. General James Jackson Chapter NSDAR, Valdosta, Georgia, 1995, 107. 1850 U. S. census, Lowndes County, Georgia, nonpopulation schedule, p. 243, line 15, Susan C. Dasher, Ancestry.com (http://www.ancestry.com : accessed 12 January 2014), citing NARA microfilm publication T1137. 1850 U. S. census, Lowndes County, Georgia, population schedule, p. 491 stamped, dwelling 550, family 550, Christian H. Dasher, digital image, Ancestry.com (http://www.ancestry.com : accessed 2 January 2014), citing NARA microfilm publication M432. Folks Huxford, Pioneers of Wiregrass Georgia, Volume 6. Jesup Sentinel, Jesup, Georgia, 1971, 69-70. 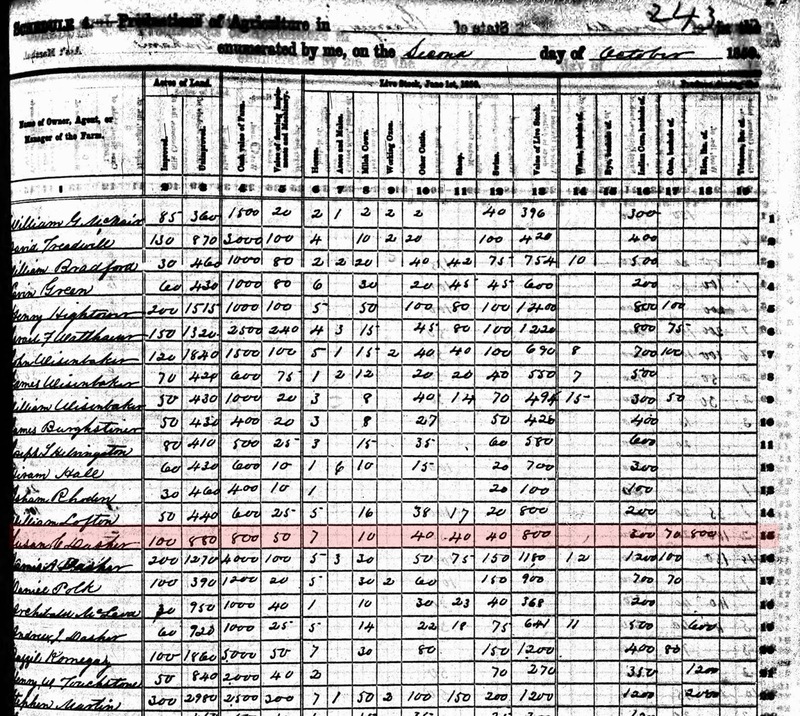 1850 U. S. census, Lowndes County, Georgia, population schedule, p. 399 stamped, dwelling 531, family 531, Susan C. Dasher, digital image, Ancestry.com (http://www.ancestry.com : accessed 2 January 2014), citing NARA microfilm publication M432.